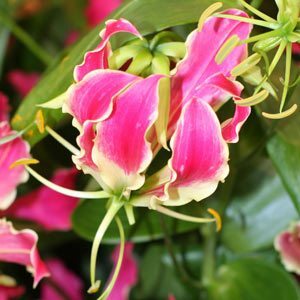 The Gloriosa Lily or ‘Gloriosa superba rothschildiana’ (picture right) is the national flower of Zimbabwe. Growing from a tuber it makes a great climbing display and is commercially valuable as a cut flower. Also known as the Flame Lily it lives up to its name with red and yellow flowers which appear in summer. Gloriosa Lilies can be planted in pots or directly into the garden, provide with some support as they are a climber. Find a warm sunny position. Prepare a humus rich well drained soil by adding well rotted compost and cow manure. Provide a climbing frame of some sort. Alway the tubers on their side, not pointed upwards. Mulch over the area to help provide a cool moist root run. The tuber actually dies once flowering is over, however before this it forms two new tubers, so life goes on. Gloriosa do not like wet conditions so lift when dormant making sure not to disturb the growing tip at the end of the tuber. The tubers cam be stored in a cool dry position over winter. Wrap them in a little peat msos or coir peat to prevent them from drying completely. However, remember to keep moist in the growing season.